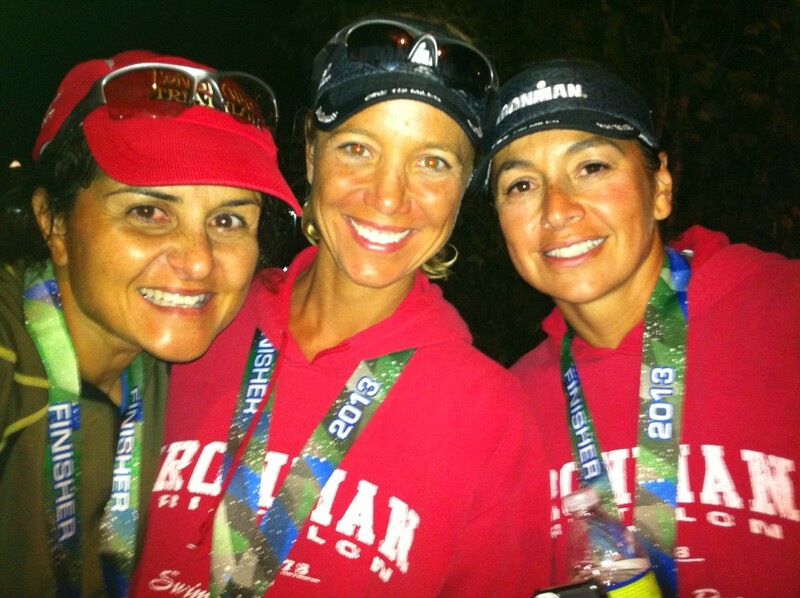 Yesterday, I posted a race report about last Sunday’s Ironman. This morning, as I was running with my friends and wearing the awesome shirt I was given at the finish line of the race (pictured below), it occurred to me that there are many stories within and around my story about Ironman that I didn’t tell. Here are some examples. The night before I flew out to Coeur d’Alene, I went to see Megan Hilty of Smash at the Topfer Theater. She spoke and sang and made me laugh. I loved it, even though it meant getting home at midnight before an early morning flight. In Coeur d’Alene, we got lucky with the weather. It rained Wednesday, Thursday, Friday morning, Monday, and Tuesday. Friday afternoon, Saturday and Sunday (race day) were perfect. There were 848 first timers in the field. Mike Reilly likes to call them Ironvirgins. Five people lost over 70 pounds training for this race. Of those five, three people lost over 90 pounds. The biggest loser lost 175 pounds. He jokingly said he lost 175 pounds twice because he also got divorced. After the opening dinner (where these statistics were handed out), Mom, Jeanie, Malinda, Brian and I were walking home and narrowly avoided getting hit by a car that had hit a parked car and was speeding away from the scene. He ended up speeding a bit too quickly and skidded into a pole and then proceeded to run off on foot. Brian chased and cornered him until the police showed up. That was way too much drama for my taste and frightening to see how close we were to getting run over by a car on the streets of Coeur d’Alene. The oldest male competitor (a 72-year-old) got hit by a car during the bike portion of the race. As of Monday morning, he was in the hospital but doing well. I hope he has since made it home and is well on his way to recovery. During the last couple of hours of the Ironman, the pro winners come to the finish line to hand out medals. So when I crossed the line, Heather Wurtele put my medal around my neck. I love having that experience. I suspect they are as exhausted as the rest of us, so for them to stand out there for hours late at night dancing and cheering with the crowd and handing out medals is pretty amazing. Thank you, Heather. Your presence meant a lot to those of us who finished late in the day. In the line for finishers’ store, I stood behind a woman I had met this past August in the Canada finishers’ store line. This is sometimes a crazy small world. At my rental house, I didn’t have wireless Internet so I was disconnected the entire week except for my phone. It’s been a long time since I went without Internet access for so many days. I kind of liked it. Yesterday, after spending the morning doing a swim, a bike and a run as my last longish workout, I went to a swim shop to pick up a new cap and goggles. I wanted a back up set for my race, just in case. While I was there, I saw headbands with great phrases on them. I put two of them together and snapped this photo. 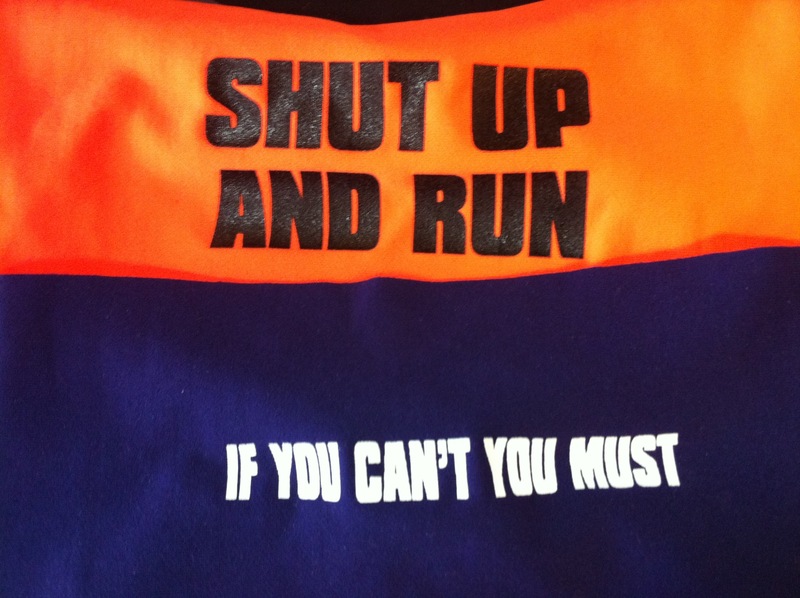 As I prepare myself mentally for my race next week, these phrases speak to me. I know I’ll have moments of doubt – moments where I tell myself that I can’t go on, that I can’t take getting kicked one more time in the water, that I can’t pedal another stroke, or that I can’t take another step. When any of that happens, I need to tell myself these things. Shut up and do it. You must. This morning, I met my friend Erin on the trails and we ran some intervals together. My taper has worked. I felt a spring in my step. I hit the intervals I wanted to hit, and it felt easy. I think I’m ready. This afternoon, I’m doing laundry and packing. I’m determined to be mostly packed today because I know tomorrow and Tuesday will be busy at work. I don’t want to be stressed about finding time to pack. It’s nice to have the time at home with Bread and Butter, and it’s exciting to get myself together for my fourth Ironman. Five years ago, I couldn’t imagine doing one. I certainly still find it hard to believe I’ve done three and am on the verge of my fourth. I was thinking this morning as I ran the trails about the first time my friend Teri introduced me to Lady Bird Lake. It was 1999, and it was known as Town Lake at the time. She showed me the three-mile loop. Somehow she had convinced me to do a marathon training program with her. I was just getting started and couldn’t remember the last time I’d run three miles. But we went out there and she showed me where to turn to stay on the trails. We started at the Mopac footbridge and ran counter-clockwise. We were just past the boat dock when Teri told me that we were coming to the final bend and the homestretch. I thought, “We can’t get there soon enough.” I was dying, gasping for air, struggling to stay with her. Now the three-mile loop is easy. I’ve run the trails and that particular bend hundreds of times. It’s fun to see how far I’ve come and how much my perspective has changed. I’m giddy. I look in the mirror, and I see how strong I look. I look back on my training notes, and I know I’ve done the work. I feel rested and anxious to get on with the race. 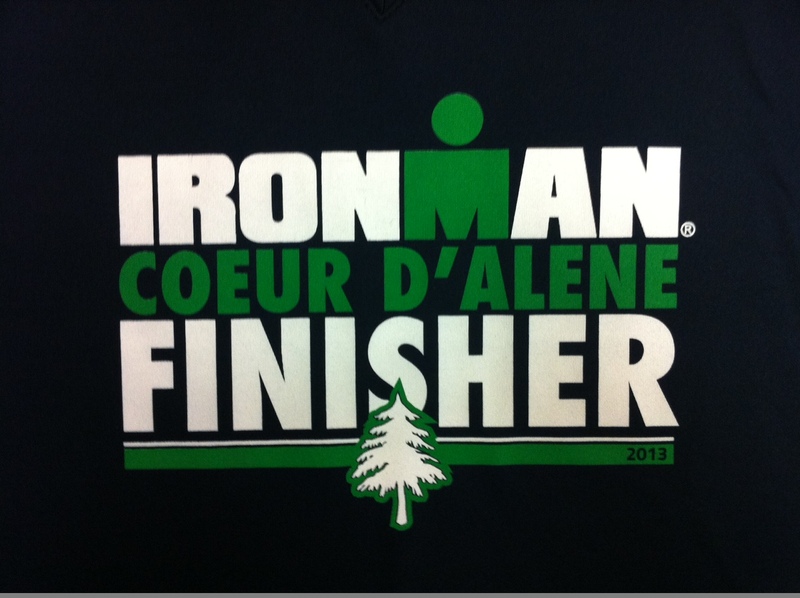 Jeanie, Malinda and I leave on Wednesday to head to Coeur d’Alene. As far as I’m concerned, we can’t get there soon enough. My bike is out of my hands. I dropped it and my gear bag off tonight with Tri Team Transport for a safe journey to Coeur d’Alene. This race is happening! Last time I went to Coeur d’Alene, I was super nervous dropping off my bike. I remember that my hands were shaking as I tried to fill out the tags that would be attached to my stuff. Today, I wasn’t nervous. I calmly packed my stuff, loaded my car, and headed to the drop off point. I could feel my energy rising on my way there. And as with St. George, I forgot to give my bike a good luck kiss. But that’s okay. My bike and I understand one another. I know we’ll be fine. Something has happened to my energy today. I think it has everything to do with my lunch with my friend Ginger. I got a text from her this morning inviting me to lunch. I wasn’t sure I’d be able to go because of work, but it worked out. I started out updating her on me. In other words, I started out complaining a bit. But eventually the conversation turned to her and the wonderful things happening in her life. As we spoke, my spirits just lifted. I can’t really explain it except to say that it felt good to be in the company of a dear friend. It felt good to be heard and understood. It felt good to listen. It felt good to laugh. Time with Ginger was exactly what I needed. After lunch, I went back to work in a much better mood – a much better place mentally. And then tonight, I got to prep my stuff for my race, which just excited me more. I can’t wait to get to Coeur d’Alene. I’m ready for it. Be safe, speedy bike. I’ll see you next week. The week before I leave town for my big race, work has gone nuts. Isn’t that how it goes? Still I managed to sneak away briefly yesterday to attend Capital City Toastmasters. And I’m so glad I did. Corky took us through a great meeting that consisted largely of table topics. He posed “simple” questions. Hot or cold? Wet or dry? Male or female? Big or small? My question? Backwards or forwards? Kick me in the gut, why don’t you? I want so much to go back in time. Back to college when I was rushing through in three years to become an adult. I would choose differently and spend time abroad for no reason except to spend time abroad. Back to my twenties when I was choosing people who never quite loved me. I would choose differently so as not to waste so much time and effort on those who did not reciprocate the feelings I had. Back to my early thirties when I had a fantastic group of friends from church that I pulled away from when our group grew and turned into what the church called the “singles” ministry. How I hated that term. I would choose to stay a part of it and not let a word and the awkwardness of people pairing off in that environment affect my friendships. Back to the last few years when I found someone I could really love who I believed could really love me. I wasn’t confident enough to dive in the way either of us needed me to. I would most certainly choose differently there. I want to go backwards and fix these things. But that’s now how life works, is it? Forwards is my only option. So forwards I go. But what does that mean? What’s ahead of me? I wish I knew. All I can do right now is focus on one thing at a time. Right now, that thing is Ironman Coeur d’Alene. This time next week, Jeanie, Malinda and I will be in Coeur d’Alene. We’ll be settled into our rental homes. We’ll be preparing to drive the course and prep our gear bags. We’ll be going for bike rides and testing out the water temperature in our wetsuits. (I did finally get a new wetsuit.) We’ll be trying to stay calm in the days leading up to the race. I don’t know what I would have done with myself these last six or eight months if I didn’t have Coeur d’Alene ahead of me. It’s given me something to focus on and work towards. It’s forced me out of bed and into my life even when that was sometimes the last thing I wanted. I’m grateful for the timing of this race. I’m grateful for my focused preparation. I’m grateful for the experience I’m about to have. When I look forwards, I can only see to this race. I don’t know what comes after that, but I know I will continue to move forwards. “Striving for possibilities beyond Ironman” – that’s the subtitle of this blog. Those are my words. After this race, I’ll have to give some real thought to what those words mean to me now. I look forward to finding the next thing, whatever that may be. But for now, I continue to focus on a successful taper, careful packing, and my adventure back to Coeur d’Alene. It’s been five years since Jeanie, Erin, Malinda, Robin and I first did this race. I have looked back each year on the anniversary of the race with much joy. The first anniversary. The second anniversary. The third anniversary. The fourth anniversary. I’m curious what the fifth anniversary will hold for us. All good things, I hope. Smooth water for the swim. Minimal wind for the ride. Fresh legs for the run. Forwards we go. Forwards I go. To Coeur d’Alene. 150 Reasons Why I Feel Ready. I rode over 100 miles today! I needed that. I have done some long trainer rides, but I hadn’t been out on the road for more than five hours. Today, I did a two-part ride to give me the time in the saddle that I knew I’d need to build my confidence. I rode from my friend Fred’s house out to Parmer, a ways past 2238, which was something over 60 miles. Then I rode the dam loop, which is 43 miles. I was tempted more than once to cut it short, but I didn’t. Last year, when I was racing Canada, I had quite a bit of confidence on the bike, in part because I had done a tough half, a double dam loop ride, and a 100 miler. I haven’t done a double dam this time but I did want to get my 100 miler in. That was a huge physical and mental accomplishment today. Plus, I ran for a solid 50 minutes afterwards. Last year, at most I would run 10 or 15 minutes after a long ride. A couple of weeks ago, I did a crazy long trainer session of seven hours followed by an hour run. Between that and today’s workout, I’m feeling pretty proud. I felt ready last year. I think I may be more ready this year. I’m leaner than I was. My running has improved drastically. That I’ve done longish runs after long rides astonishes me because I usually do at least some walking the first hour of an Ironman run. I need to think goals now. I have some goals for before the race and for during the race. Figure out the wetsuit situation. My wetsuit split at St. George. A sweet friend has given me hers, so I need to try it on and see if it fits. That’s a good project for tomorrow. Figure out nutrition. I need to write down my plan and study it, so I don’t forget nutrition on race day. I tend to get so focused on what I’m doing that I forget to eat or drink. I don’t want to make that mistake this time. Clear my head. At St. George, I didn’t do a good job of clearing my head, and it showed. I need to go into this race with a clear mind and total focus. Have fun. I have a lot of worry associated with these races. More specifically, I have a lot of worry associated with the clock that governs these races. If you don’t make the cutoffs, your day is over. I worry about the clocks a great deal. I’d like to worry a little less. Push myself harder than I have before in any race. This is related to the clocks. But it also has to do with wanting to run as much of the run as I can. I do walk the aid stations because I can’t eat or drink and run at the same time. But aside from the aid stations, I want to run. If I can run for an hour after these long rides, maybe I can run for six hours. Be in the moment. I want to enjoy the trip, the people who are making the trip with me, the time spent driving the course, my workouts while I’m in Coeur d’Alene, the time spent getting my gear bags together, the opening dinner, race morning, race day, post-race celebrations, and the closing dinner. I want to appreciate all of them and not be thinking about anything else. The race is two weeks from tomorrow. My body is ready. I’ve got a little work to do on my mind, but today was good for it, and I think it’ll be ready too.